There was a time no so long ago, when people would throw food scraps, peelings and the like into the compos heap in the back corner of their garden. The rest of the household rubbish went into the dustbin in plastic sacks. Since those days, things have changed. Now you can feed the compost heap with the plastic sacks too. British company Symphony Environmental is producing fully degradable bin bags, carrier bags and other plastic bags from polyethylene, using new additive technology to reduce the plastic to carbon dioxide and water in just a few weeks. Symphony's material is the first example of 100% degradable polyethylene. The plastic, known as SPITEK, has the same mechanical properties and processing characteristics as regular polyethylene and so can be used in the same way to make products. However, it has a special ingredient - up to 3% of a degradable compostable plastic (DCP) additive made under license from its developers EPI. This additive acts as a catalyst for the degradation of the polyethylene, kick starting the process when conditions dictate. The need for a fully degradable plastic is pressing. Millions of tonnes of plastic waste, including refuse sacks, carrier bags and packaging, are buried in landfill sites around the world each year. China generates about 16 million tonnes, India 4.5 million tonnes and the UK 1 million tonnes, of which more than 800,000 tonnes is waste polyethylene. Other disposal routes are possible for these materials, such as recycling and incineration, but as much of the waste plastic is mixed up with other materials in the domestic and industrial waste streams, separation is costly particularly for small items such as carrier bags. Conventional polyethylene products can take longer than 100 years to degrade, taking up valuable landfill space and potentially preventing the breakdown of biodegradable materials contained, say, in a refuse sack. Symphony claims that its new plastic could effectively increase the capacity of landfill sites by as much as 20 to 30% by breaking down in a short time and allowing other materials to degrade. The SPI-TEK material can be engineered to degrade in as little as 60 days or as long as 5 to 6 years, depending on the application. The level of the proprietary EPI DCP additive effectively determines the rate of degradation and the shelf life of products made from the polyethylene. Degradation is initiated by a number of factors - sunlight, heat and stress from pulling and tearing can all start the process, which then continues even if the material is in landfill or under water. The catalyst causes carbon-carbon bonds in the polyethylene backbone to be broken, reducing the molecular weight and durability of the material. Tests have shown a reduction in molecular weight from a quarter of a million to less than 4,000, at which point the material can be digested by microorganisms in the soil and water. The final products of the degradation process are simply carbon dioxide and water. The DCP additive is neither water soluble nor toxic, making the material safe for disposal in landfill sites such as the flushing bio-reactor systems that are widely used in the UK. These systems introduce pressurised water flows into the layers of waste material, feeding oxygen and microorganisms down to the degrading rubbish. The material will also degrade under other conditions, not just in the composting-type conditions of a landfill site. Figure 1 shows the effect of photo and thermal degradation on a carrier bag made from the new polyethylene compared to standard plastic, The bag degrades to mulch in just 55 days. Extensive tests such as this one and tests on buried material were carried out on the new polyethylene to prove its degradability, including testing with Pira International. Symphony intends to launch a wide range of products made from its new polyethylene, including everything from small produce bags and carrier bags to larger packaging items and products such as degradable plastic aprons for children. The possibilities are great for the new material because it has the same performance as conventional polyethylene and yet doesn't have any cost restrictions on its use. 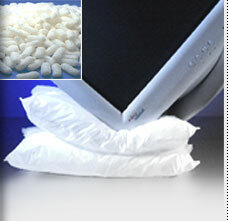 Refuse sacks are already on the market under the Tuffy brand name, promoting the material's environmental credentials. The bags come with a list of dos and 'donts on the label advising users how to store the bags and so prevent premature degradation. Apart from that, they are exactly the same as any other refuse sacks. Of course, Symphony Environmental is not the only company producing new materials that could end their lives on the compost heap. Bayer is currently testing a new polyester amide biodegradable plastic that it claims is 100% biodegradable and recyclable, and yet also has excellent properties including a high tensile strength. The plastic has additional green credentials as it is produced without solvents, chlorine or any aromatic ingredients. BAK 1095 is a semi-crystalline, largely transparent thermoplastic that breaks down into carbon dioxide, water and biomass under composting conditions. Its degradation rate is comparable to that of other organic materials that are composted, and yet its physical properties are similar to those of typical polyolefins such as LDPE. Bayer says that the plastic is suitable for a number of processes, such as film blowing, extrusion, thermoforming, spinning, injection moulding, blow moulding, colouring, printing, hot sealing and welding. It suggests that potential applications will be in areas such as horticulture, agriculture or the food sector, in which plastics must be used in conjunction with compostable waste.